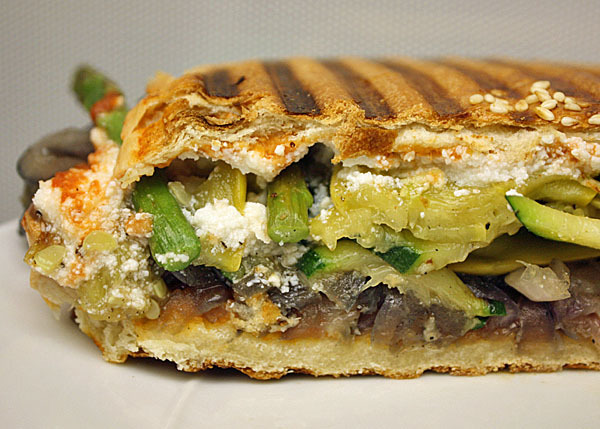 Here’s Week 24, Meal 3: Grilled vegetable panini with ricotta and roasted bell pepper puree. It’s doesn’t exactly fill the same void a nice slab of pizza would, but it’s a worthy substitute for the most part. Start by making the red pepper puree. 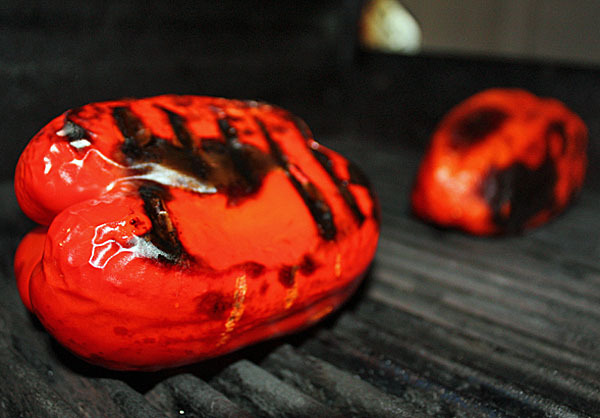 Heat your grill to high and grill 1 bell pepper (I doubled the recipe) until all sides have some char on them. Place the pepper in a plastic bag or container for 15 to 20 minutes until the skin easily separates from the flesh. When the pepper is ready, discard the stem and seeds and blend the pepper with 1 T of balsamic vinegar. Season with salt and pepper and reserve. While the pepper is cooking, slice up your veggies. 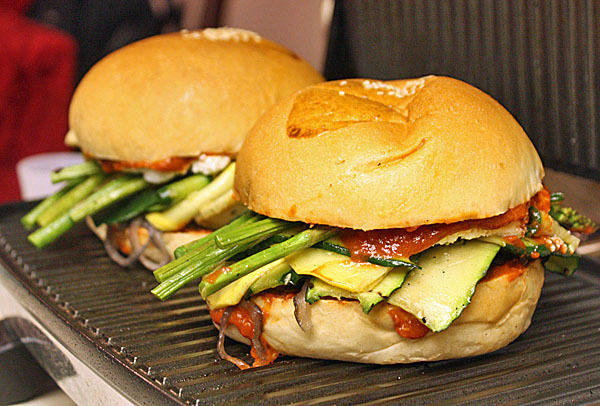 Chef Brian calls for a 1/8-inch lengthwise cut on 1 zucchini, 1 yellow squash and 1 red onion. Using a mandoline makes this super quick. Also, chop the bottom of the stalk from 8 pieces of asparagus. Toss the veggies with 1 T of olive oil and season with salt and pepper. Before you head out to the grill, preheat your panini press. 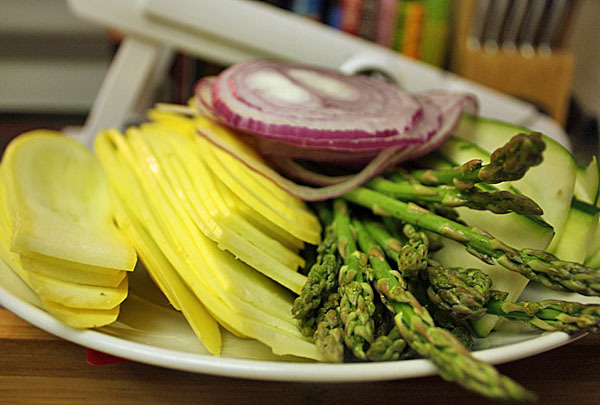 At the grill, cook the veggies until they have some char, about 2-3 minutes for squash and asparagus, and a little longer for the onion. Spread each side of the panini bread with the pepper puree. Layer one half of the bread with the veggies in any order and spread 1/4 cup of part-skim ricotta cheese on the other side. Press the panini until the bread is nicely toasted, then cut in half and enjoy! 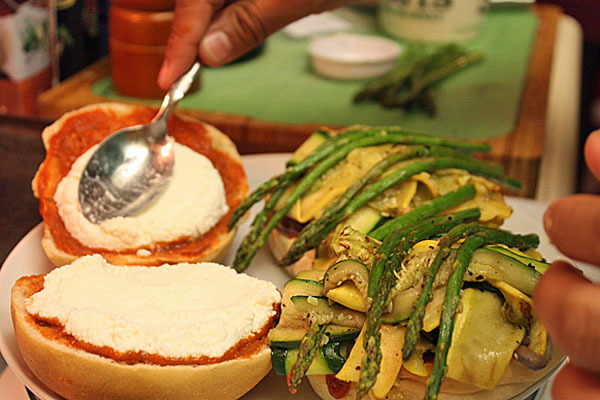 It’s a simple sandwich, built up with an array of sweet veggies, then flavored just slightly by the tang of balsamic vinegar and cooling ricotta cheese. Lots of flavor with only a few ingredients. Try this one on your next Meatless Monday.